BioGPSBioGPS (the cylinder in the left foreground) is a GPS receiver that is mounted alongside the C-OPS surface reference sensor. The receiver is electrically integrated so that its data is merged into the data stream of the C-OPS allowing transparent recording of location information during a vertical cast, or while the ship is moving and surface reference data is being acquired. BioGPS integrates into the C-OPS network with the BioSHADE and one or more surface reference instruments. 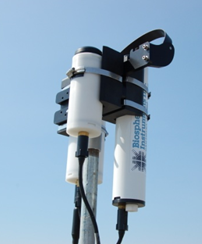 This assembly of BioSHADE, BioGPS, and radiometer is supported by a single cable and can be located as far as 150 m away from the deckbox/power supply. This deckbox will automatically compensate for cable length.